Though it is far from the only possible way to evaluate news coverage, the chyron has become something of a touchstone for media analysts, being both the most obvious visual example of spin or distraction and the most shareable. Any negative coverage of the president usually prompts a flurry of tweets cataloguing the differences among networks in their chyron text. While CNN, MSNBC and the BBC are typically in alignment, Monday morning was a particularly stark example of how Fox News pushes its own version of reality. Read The New York Times opinion piece, and dig into the data yourself. 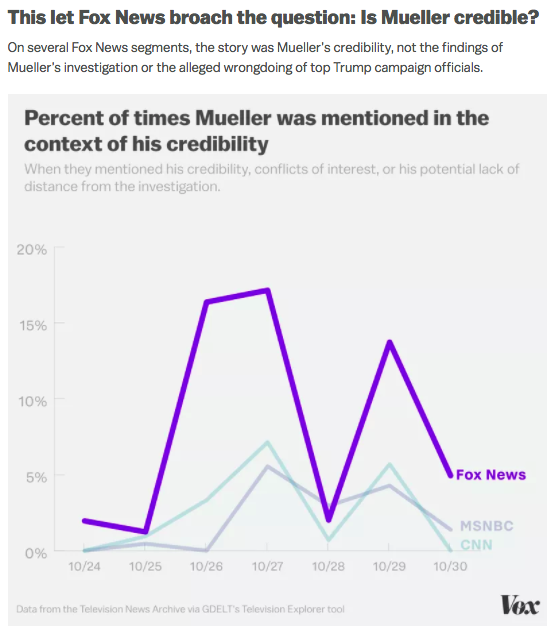 Fox News actively tried to “plant doubt in viewers’ minds” as Mueller brought charges against former Trump campaign officials, according to an analysis of a week’s worth of closed captions by Alvin Chang of Vox News. Chang used Television Explorer, fueled by TV News Archive data, to crunch the numbers behind charts such as the one below. And The Trace, an independent, nonprofit news organization that focuses on gun violence, used TV News Archive caption data via Television Explorer to show how TV news coverage of mass shootings declines quickly. In the 24 hours following news breaking about the indictments, our Face-o-Matic data feed captured cable news networks’ editorial choices on how much face-time to allot to congressional leaders’ reactions. The answer: not much. This integration makes it easy for journalists, fact-checkers, educators, scholars and anyone that wants to relate specific text in a webpage, PDF, or EPUB to a particular snippet of video news coverage. All you need to do to use it is copy the URL of a TV News Archive video page, paste it into the Hypothesis annotation editor and save your annotation. You can adjust the start and end of the video to include any exact snippet. The video will then automatically be available to view in your annotation alongside the annotated text. See a live example of the integration in this annotation with an embedded news video of Senator Charles Schumer at a news conference over a post that checks the facts in one of his statements. Please take Hypothes.is for a spin and let us know what you think: tvnews@archive.org. 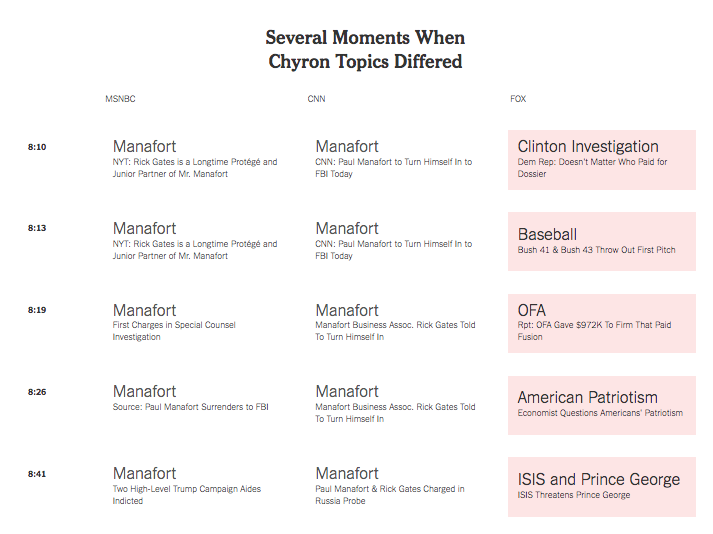 This entry was posted in Announcements, News, Television Archive and tagged captions, chyrons, Face-O-Matic, Factcheck.org, George Papadopolous, Hypothes.is, Paul Manafort, PolitiFact, shootings, Television Explorer, The New York Times, The Trace, Third Eye, TV news archive, Vox. Bookmark the permalink. Thank you for the update! Interesting week! Thank you, nice and interesting article.